HTML is the core technology for building websites. Today, with HTML5 opening the Internet to new levels of rich content and dynamic interactivity, developers are looking for information to learn and utilize HTML5. HTML5 24-Hour Trainer provides that information, giving new and aspiring web developers the knowledge they need to achieve early success when building websites. 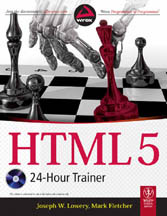 Written by bestselling author Joseph Lowery and with DVD content created by well-known multimedia and eLearning producer Mark Fletcher, HTML5 24-Hour Trainer brings the new features of HTML5 and the Internet to life unlike any other resource. HTML is the core technology for building web sites; the latest version opens the door to new levels of rich content and dynamic interactivity. This easy-to-follow book-and-DVD package is an ideal introduction to HTML5. Featuring straightforward lessons and expertly crafted training videos, this guide imparts the instruction you need to get started creating your own sites. HTML experts Joseph Lowery and Mark Fletcher cover the basic aspects of a web page, discuss the advantages of using CSS, and share examples of real-world web development to provide the foundation you need to start successfully constructing your own sites. The lessons within the book are each accompanied by an instructional demonstration on the DVD—hours of video tutorials! Joseph Lowery is a professional web designer and an internationally bestselling author of such books as Dreamweaver CS5 Bible and Adobe CS4 Web Workflows. He is an Adobe Community Expert and regularly presents at Adobe conferences in U.S. and Europe. Mark Fletcher, an eLearning Developer specializing in Rapid e-Learning Development, has worked with many blue chip companies and has presented at a number of conferences on e-Learning.